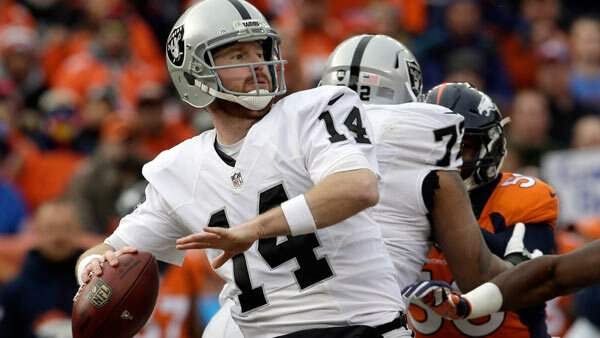 PHILADELPHIA (WPVI) -- Former Penn State quarterback Matt McGloin has agreed to a one-year deal with the Philadelphia Eagles. The Eagles made the announcement Monday on Twitter. McGloin went undrafted in 2013, but was signed by the Oakland Raiders as a backup quarterback. The Scranton, Pa. native spent the last four seasons with the Raiders. McGloin joins quarterbacks Carson Wentz and Nick Foles on the Eagles roster. Also on Monday, the Eagles announced the hiring of Paul Lancaster as the team's director of player engagement. Lancaster will serve as a mentor and resource for all Eagles players off the field. The team says he will be "responsible for building and maintaining relationships and promoting high standards of professionalism to help ensure success during and beyond their years in the NFL."